Folk circuit favourites Bellowhead rescued bits of junk from around the globe to cobble together a percussion session worthy of the new album. It includes a paint tin from Morocco as a bass drum, a cake tin from Texas as a snare, and an alarm bell and a cutlery drainer used as a hi-hat. Percussionist Pete Flood also uses old knives and forks for drum sticks. 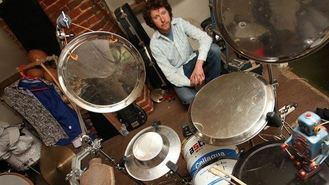 Some of the unorthodox instruments were trialled during a Bellowhead gig at the Royal Albert Hall in April, including pots and pans as well as unwanted kitchen equipment. An instructional film showing how to make a drum kit from junk is available on the band's website at bellowhead.co.uk. Bellowhead will release Revival, the band's fifth studio album, on June 23 and kick off a nationwide tour later in the year.